PV arrays can be used to generate electric power for many end-uses including utility-scale PV projects, or in distributed applications such as homes, cabins, businesses, telecommunication equipment, lighting, and other electrical equipment. The economics of utility-scale PV projects (solar farms) is difficult to discern given the small and diverse sample of projects and the proprietary nature of third-party contracts. However, the economics of distributed PV systems is well-known. The financial-side of distributed PV is determined by the capital and operating costs and will vary according to the type of PV power system; off-grid and grid connected. Off-grid PV systems in Arizona are cost competitive with electric utilities in situations requiring utility line extension at high-cost (generally for extensions of over 0.5 miles, charged to the customer), and in situations requiring low amounts of power (irrigation control equipment, small lights, etc.) for which the minimum utility charges exceed the amortized cost of the PV system. Like solar in general, the capital (initial) costs of off-grid PV systems have been falling in recent years; they currently are between $1 and $3 per peak watt of the PV module, less if rebates and tax credits are available. Storage batteries with related charge controllers cost about the same, but until newer battery technology is in volumn production, costs are rising. Off-grid systems are typically combined with energy efficiency measures to make sure the solar electricity is not going to waste. When designing an off-grid system a quick-rule to follow is that for every dollar spent on energy efficiency measures will save $5 or more on solar generating equipment. A small house (or larger house with extensive energy efficiency improvements) with a low usage can function with an off-grid PV system as small as 2 kW (peak), thus would call for a capital outlay of $10,000 to $16,000 (before any incentives). Assuming a 20-year simple amortization, this would be equivalent to about 10-20 cents per kWh. Such a unit can supply power for many appliances (refrigerators-freezers, computers, televisions, consumer electronics, etc.) and many lighting systems. It will not provide power for air conditioning or other large energy consuming appliances like clothes dryers or electric ovens. Comparable costs for alternatively home generated power vary but are typically significantly more than the solar alternative. PV power costs for uses that do not require batteries, such as agricultural water pumping and pool pumps, are substantially lower than off-grid residential systems that include batteries. 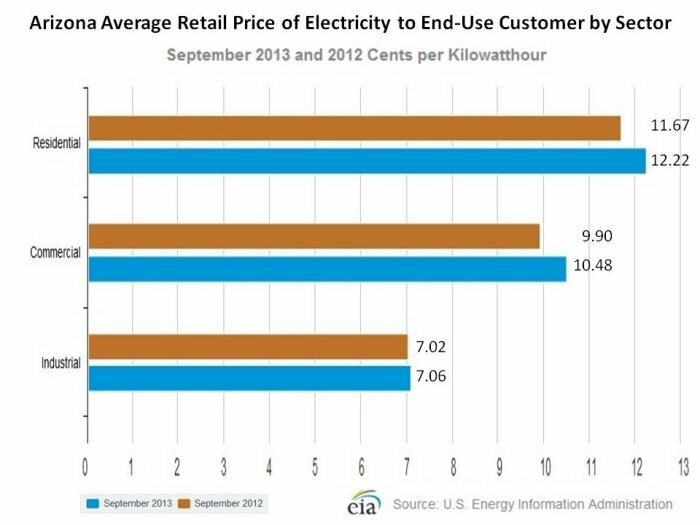 While solar has a ways to go to compete with conventional power plant generation costs at 4-6 cents/kWh, it is much closer to grid-parity when compared to the cost of electricity charged to residential, commercial and industrial consumers. This is especially relevant because when the PV is sited at the consumers' premises, then the customer is comparing the cost of PV electricity to the cost of the utility retail power, not to the cost of power generation. Grid connected PV systems can be of two types, customer-owned or third-party owned (leased). Leasing a solar electricity system is similar to leasing a car with the biggest exception being the contract terms are much longer in length for solar (typically 15 to 20 years). However, like a car lease, you pay a monthly fee to use the system over a specified period of time. The property owner benefits from the electricity produced by the system. Ideally, the cost of the monthly lease payment is less than the cost of the utility supplied-electricity that is offset by the solar system. A customer-owned system is not cost-effective compared to utility electric power, but when combined with other considerations become more attractive and economical. Government subsidies, tax rebates/exemptions, the time of day value of summertime PV power, the enhanced value of "Green" power to a utility, etc. can and have made PV systems practical in Arizona. The value of a PV system's electricity will depend on how much you pay your utility for electricity and how much your utility will pay you for any excess that you generate. The average cost of electricity from Arizona utilities is displayed on the chart below. Net metering is the mechanism by which Arizona utilities pay customers for any excess solar electricity they generate. The Arizona Corporation Commission allows for a kilowatt-hour (kWh) credit at the utility's retail rate for each solar kWh not used by the customer and fed back into the grid. At the end of each month any net excess solar generation is carried over to the customer's next bill. Any remaining credits on the customer's last monthly bill on an annual basis will be paid to the customer, via check or billing credit, at the utility's avoided cost payment. This net metering arrangement was implemented as a way to help encourage PV system interconnection. It allows system-owners to offset some of the costs of purchased electric power by selling surplus electric power back to the utility. In an Off-Grid situation this excess power is typically stored in a battery bank for later use, but in a grid connected system with net metering, the excess power can be "sold" to the utility for use by other customers, and is generally an offset to the purchased power (such as night-time use). Net metering rules differ among Arizona electric utilities. It is necessary to check with the utility serving a specific address to determine what rules apply for net metering customers in their service territory.